Looking at my computer screen now, I am again reminded of the infinite scope of the internet. Up to 1.5 billion websites are scattered around this cyberspace. It’s funny, isn’t it? How it looks so small on my HP monitor…yet, it’s anything but small. Several dozen search engines, like yahoo, bing or google, are used to make navigating easier. A man who knows this well is Richard Conway. Born in Hertfordshire, England, and moving to New Zealand after discovering it in 2009, Conway arrived with a mind full of inspiration and dreams. He has a Bachelor of Science in Business Computing (Honours) and has gone on to create many amazing job opportunities for himself and others. Conway is the founder and CEO of search-engine optimizers, Pure SEO, is a columnist and regular contributor to M2, M2Woman and now bonafide author. 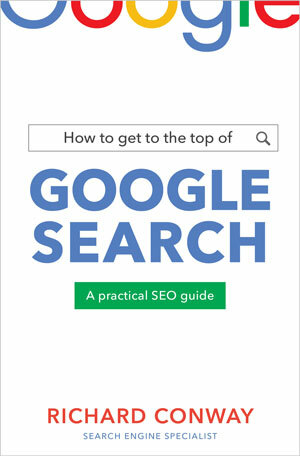 Published by Penguin House in early March, Conway’s new book, How to Get to the Top of Google Search: A Practical SEO Guide, embraces the trivial maze and vastness that is the internet search engine and what content can be used to make it more easily accessible with tools and tricks of the trade. The following Excerpt is from How to get to the top of google search: a pratical seo guide by Richard Conway. As you’ve discovered in the previous chapters, SEO has seen many advances over the years. While you don’t need to become a specialist in all these aspects to do SEO well, you do need some level of understanding of how they work. One such development is the move towards machine learning to power and process search results. Witness a recent Google search innovation — RankBrain. Artificial intelligence (AI) and machine learning have taken the world by storm over the past decade or so. We’re starting to see the application of AI in a range of different everyday applications, from online customer support, chatbots and virtual personal assistants to smart home devices or music and movie recommendation services such as Spotify, Pandora and Netflix. Essentially, AI is about getting computers to respond to situations in the same way that humans would. It’s about introducing elements like judgement, perception, reaction and decision-making — all factors that, until recently, didn’t exist in computers. Machine learning is a type of AI that focuses on experience — in much the same way that we learn and improve over time, based on our memories, a computer will remember the outcome of a previous situation, and adjust its reaction accordingly. These two concepts are critical to RankBrain. RankBrain seeks to understand what a user is looking for (using AI), then improves the experience each time based on previous searches (machine learning). But before you start picturing robots well and truly taking over the world — and your mind — let’s take a look at how RankBrain actually works. RankBrain looks at a user’s intent when searching — inferring the meaning behind the actual words they use in a search. It then customises its user experience, and the results it serves up, based on that. Basically, RankBrain is related to the processing and refining of search queries. At first it used pattern recognition to tackle complex or ambiguous search queries and connect them to specific topics and content, and now it does this with all search queries. Put another way, RankBrain’s algorithm is geared towards understanding user intent, linking this to common searches, and presenting these results. RankBrain teaches itself to sort through the billions of web pages online and return the results in terms of relevance, which we can all agree makes for a better search experience. More amazingly, because of its machine-learning component, RankBrain teaches itself over time — making ever-smarter connections between search terms and desired results, so since its rollout in early 2015 it’s improved its understanding. In 2015, RankBrain was used for less than 15 per cent of queries. However, since that testing by Google — and as confidence in its results has grown — RankBrain is now used in the processing of every query that Google handles. Because RankBrain is continuously learning from its original programming as well as developing new connections, it allows Google to be proactive — making assumptions about what you may be searching for, based on the words you use and your previous behaviours. Let’s consider an example . . . say you search ‘best bar in Auckland’. What you’re likely to want to see is articles and listicles comparing the top bars in the city. You want lots of information, so you can read through and do your own comparisons, based on what ‘best’ actually means to you. What you don’t want to see is a bunch of websites claiming that they have the best bar in Auckland — that’s not helpful to you. If you search ‘best bar in Auckland’ and only get ads or articles about specific bars, you’ll probably do another search — something like ‘top 10 bars in Auckland’ — which will hopefully then show the results you’re after. RankBrain’s job is to predict this in advance and understand your intent based on your initial search, linking this to other, more common searches, and presenting you with those results. It’s not a whole new way of searching, but instead an addition to Google’s overall algorithm that includes other ranking factors focused on fighting spam, improving local results, favouring mobile-friendly sites and demoting adheavy pages (among other things!). RankBrain differs from previous search engine practices in its interpretation of search terms. Think of it as a ‘query interpretation model’. Basically, it’s aiming to return results that are related to, but do not necessarily contain the same exact words as, the original search. It also focuses on effectively interpreting ‘long-tail’ queries to find the user’s intent. As you might imagine, RankBrain is also improving the way that Google understands the different meanings that one word can have, applying an understanding of context to avoid irrelevant results. Look around! It’s not the best idea in all arenas, but in search land it pays to act like everyone else if you want to rank for a particular term. Analyse the top competing pages and see what they have in common with each other that you could implement (with your take on it!). That said, be careful not to plagiarise. Google processes three billion searches per day and estimates suggest that 15 per cent of those are queries that it has never seen before; that is over 450 million totally new and unique queries every day! Among those are ‘long-tail’ queries (complex, multi-word searches, like when you type a whole question into Google). RankBrain effectively translates them, seeing patterns and connections or similarities between different complex searches, in order to determine what relates to particular topics and to find the best pages to serve up in its results. As we’ve already seen, Google’s mission (like any business) is to ensure the best experience of its users — which in its case means providing the best results to searchers. RankBrain is key to this; it exists to provide Google users with the search results they want to see. Because of this vital role, RankBrain has rapidly become one of the most important factors in search engine marketing. In fact, Google itself recently announced that it was the third most important factor in determining search rankings, behind quality content, which we explored in chapters 5 and 6, and links, which are explored in chapter 12. This is good news for searchers who can’t always come up with the keywords that they need, but also has implications for anyone wanting to make the most of search marketing for their business. The introduction of AI means that Google’s algorithm is even less straightforward to explain than previously. That said, in some ways RankBrain furthers our understanding of how search environments are changing. The feedback loop that’s leveraged by the frequent measurement of results means that it’s possible to continuously improve SEO copywriting and more easily understand the impact that changes to a website have on its ranking, which is ultimately good news too! CAN YOU OPTIMISE FOR RANKBRAIN? Most of the experts agree that there is no way to optimise for RankBrain, in the strictest sense of the term. You might be wondering why you’re here, then — or why I’ve included a chapter about RankBrain in a book to help you DIY your own SEO, but bear with me. Unlike some other ranking signals, like page speed or mobile-friendliness, RankBrain doesn’t assign your website, or web page, a score that determines its position. Instead, RankBrain helps Google to determine which signals it should prioritise within its algorithm, based on its interpretation of user intent. And as such, it requires a different type of thinking — which is great for those who aren’t technical SEO experts. what are good Netflix shows? Whichever way you look at it, these searches are all essentially asking the same thing. Despite the fact that they use different words and phrasing, RankBrain helps Google to understand that they should all be answered with the same (or at least the same kind of ) content. Having established user intent (you’re wanting a list of the most popular shows/movies on Netflix), Google uses RankBrain to basically say, ‘now what signals are right for me to enhance or to push down for these particular queries?’. In this way it determines the priority of these other signals or factors. Considering the Netflix example further, RankBrain might determine that in the case of this particular search query, links from a vast range of sources are not that important here, but freshness (how recent the content is) is extremely important. This is logical as, if you’re doing this search, you’re expecting up-to-date results. No matter how many links are pointing to that article, it’s unlikely that you want to see what the best shows were in 2015, especially if some of that content may no longer be accessible on Netflix — so Google will downplay the link diversity signal and enhance the influence of the freshness or recency. SO, HOW DOES UNDERSTANDING RANKBRAIN HELP YOU WIN? While there’s no definitive or strictly technical way to optimise for Google’s RankBrain, there are ways to achieve subtle positive shifts. The good news, too, is that the thinking required to achieve these mostly just requires us to apply some good old human common sense. As I’ve mentioned, it’s about creating content more naturally, and employing fewer of the other SEO ‘tricks’. RankBrain may be a highly complex machine-learning algorithm but at the end of the day, it’s not rocket science — and us humans are smarter. So let’s take a look at what works — and what really doesn’t! — when it comes to SEO in this new era of RankBrain. Regardless of the rise of AI programmes, it is still humans (and not bots!) who are using search engines. We’re searching in a more fluid and conversational manner than ever before, and this will only amplify as we see an increase in voice search in the coming years. It is vital to be able to see your website, and your blog content, in the way that users will see them, and not just based on what you think Google will like. Choosing keywords, writing content and optimising web pages with colloquial language focused on intent has become the new normal. Gone are the days of trying to get inside the mind of an algorithm or system. RankBrain exists to provide the best content for people, so the best way to leverage its benefits is also to focus on people. Most users are not SEO experts, so they’ll click on the links most relevant to what they are looking for. Static, automatic approaches to SEO won’t work here, so you do need to roll your sleeves up and play the role that only humans can. Think about your visitors’ behaviour, and what changes or improvements you can make to your site or content to provide a more enjoyable user experience. Google can also help, as it gives handy hints down the bottom of the page with its ‘related searches’ list. This is another clue that helps you think beyond just the search terms that people specifically type in. We saw in chapter 1 how vitally important keywords are, and how they become the foundation for all things SEO. RankBrain doesn’t change that; you should definitely still focus on keywords, but you should also dive deeper, and take that research a little further. We need to look beyond generic keywords for the precise search engine queries that your customers will be making. Consider the intent behind your keywords — what are users actually wanting when they search for ‘best bars in Auckland’ or ‘marketing in New Zealand’? The easiest way to do this ‘behind the scenes’ work is to simply put yourself in the user’s shoes. If you were looking to find great marketing firms in New Zealand, what would you enter into Google? And what would you expect to see in the results? Ask other people about how they search and build those insights into your thinking; you may be surprised to find that different people (and especially those of different generations) will search for the same sort of thing in a very different way — despite their similar intentions. Constantly run your keywords through this experiencebased lens and use this to inform your content planning. In the age of RankBrain, those who don’t make this adjustment, and instead just continue targeting keywords and common search phrases, will be left behind. You’ll know from the previous chapters that content is still king — and plays a vital role when it comes to SEO. This overarching rule still applies in the age of RankBrain. So, what do you need to consider in terms of content, as far as RankBrain is concerned? The key point here is the increased importance of generating more inclusive content. If you want to rank well for something, it’s critical to cover all aspects of a topic and answer as many questions as possible about it. As well as keeping real-life people in mind when planning and creating content, strive to be as useful, helpful and inclusive as possible. For example, building on our ‘marketing in New Zealand’ example, you might create content that looks at how marketing has changed in New Zealand, what’s important for marketers right now, your take on some of the great marketing campaigns currently happening or ones that you think are exhibiting ‘best practice’, and top tips for people trying to choose a marketing agency or partner. Ultimately, if you aim to provide information which is indepth and useful for your audience, then you share the same goal as RankBrain, and will be well on your way to winning. When it comes to actually creating your content, keep your searchers’ intentions firmly in mind. Once you understand what users are really meaning when they search for a term, you can use this as a platform for generating great content that will rank highly and drive traffic. RankBrain means that content creation is now about writing to the fringes. By that, I mean that rather than targeting one specific keyword or phrase, it’s about including a range of synonyms and variations, as well as other words that might commonly occur in the same sentences. This makes it easier to generate more natural content, as you’re not trying to get one term or keyword in there as many times as possible (which, I can tell you, does not tend to make for a good read — plus users are savvy enough to notice, and tune out, when they see this!). All of the other principles for writing good content still apply, but here it’s key to also remember that your user is a person — quite possibly in a hurry — who is looking for your product or service. They will search for the first thing that comes to their mind surrounding the need you fulfil and, for different consumers, this will be different words. Write in a broad enough way to cover as many of these options as you realistically can, and your content will be better positioned to succeed. How to Get to the Top of Google Search: A Practical SEO Guide by Richard Conway. Published by Random House NZ. RRP $35. On sale now.